Driving down Hwy 11 with hardly a cloud in the sky, I tried to convince myself that the sun would really offset the 20 degree temperatures uncommon for most of the year in Greenville. This was not the case. It was cold and breezy enough to make my lungs burn and tickle with coughs for hours after our run was complete. The lung-burning was probably not entirely weather related since the run we did includes a 2,000 foot elevation gain that takes place over the first half of the run. Was it worth it, you may ask? The cold, the coughs, the combusting thigh and calf muscles. I would still say yes. I love this run for the challenge it presents. Still, it has not ceased to be a bit daunting every time we decide to confront it. For close to 4 miles, you climb the trail that begins at Table Rock State Park Nature Center. There are many rocky steps in the first couple of miles and even the smoother paths later on are deceptively steep and challenging, but the views are stunning and the sense of accomplishment you get from crossing over this mountain makes it all worth it. It’s also a killer workout and a good confidence boost if you’re training for any kind of more moderate trail run. The run down the mountain is an exercise in balance and precision as you plummet dramatically down from the small clearing at the top. Again you are treated to amazing views, particularly at Bald Knob. The entire loop clocked out at 8.1 miles, and took us well over 2 hours to run with stops for pictures, shoelace malfunctions, and a pre-run bathroom break all added in. 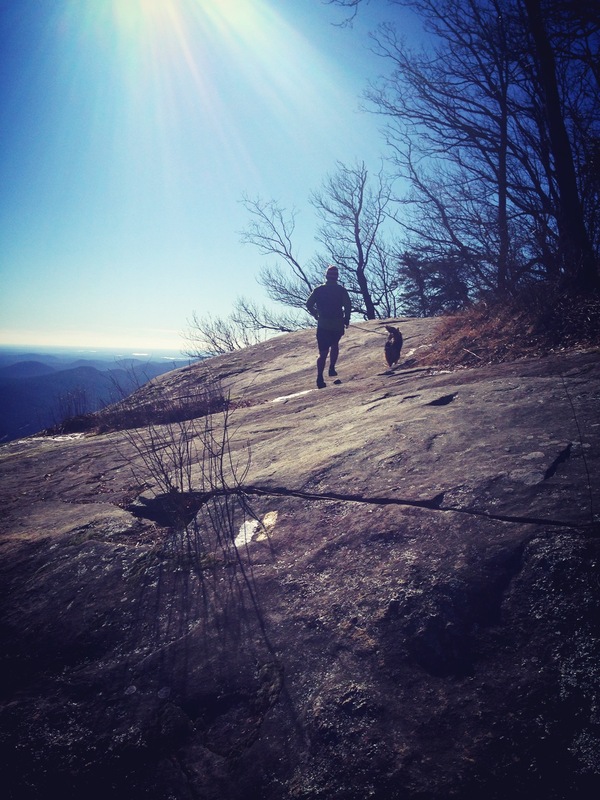 Run this trail: Go to Table Rock State Park, SC. Start on the trail that begins by the nature center. Take Table Rock trail up a series of rough steps and linking trails, passing a shelter/lookout around 2 miles and continuing until you reach a second fork. You will take a left to head up Pinnacle mountain instead of the more common hike to Table Rock. Eventually you will pass a sign that says .9 miles to the top. (Warning: This last section can feel so long!) You will reach a clearing. To the left of the clearing the path continues sharply downhill. You will reach Bald Knob , an exposed face, in less than half a mile. Keep going to the left across Bald Rock and back into the woods. Continue down following blazes until you reach the path marked by three colored blazes. Take that back to the Nature Center. Recommendations: Bring water on this run! It can get long and it’s pretty strenuous . You also might want to bring a snack at least for when you’re done if not for during the run. Watch out for bears during the summer. Wear trail shoes if you have them. You will enjoy the extra traction.